GRN aims to communicate God's truth accurately and clearly for each language and culture, especially those who are small, isolated and under-resourced. To do this we produce a range of audio and audiovisual products. Audio only programs may contain several different elements. Depending on the local culture, the needs of the people and the availability of the right help any or all of the following components may be used in a program. Songs: Most cultures love to sing. Songs are easier to remember than prose. Where the Gospel message can be communicated in the local singing styles it will have great effective. 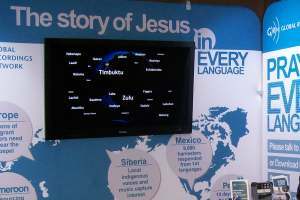 Some years ago, on hearing a recording of the story of the death and resurrection of Jesus song in the local style with local instruments, a man from a small language group in Milne Bay PNG said, "If the missionaries could have brought us the Gospel like this in the beginning, the response would have been much greater." Scripture: Where Scriptures have been translated and are suitable, recording Scripture can be a great blessing and help to the people. These programs may include whole "books" of the Bible, selections, easy reader version and other similar products. Testimony: The story of a local person who has made the journey from death to life can have a profound effect. Poetry and Proverbs: Many cultures have a high regard for these. If local skilled helpers are available, communicating Bible truth in these forms can speak powerfully to the heart. Drama, Dialogue and Questions and Answers have also been used to good effect. Many of our audio only programs carry the generic name "Words of Life". These may contain some of the above elements but will primarily be built on our library of scripts of simply-told Bible stories and Bible messages. Select from a range of programs in over 6,000 languages.